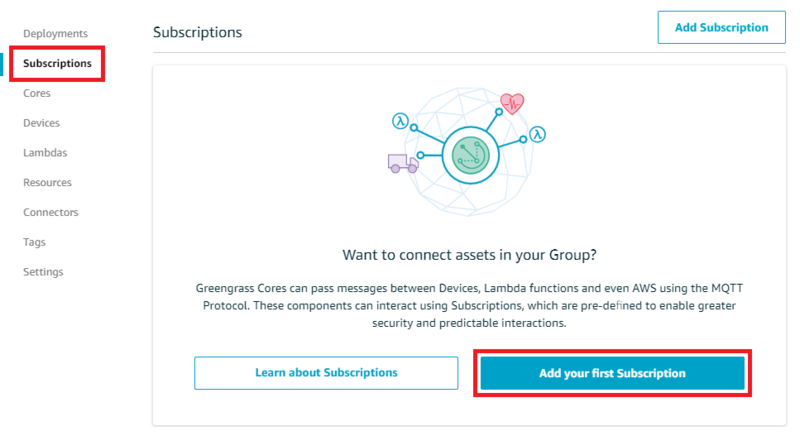 You are now ready to configure your Lambda function for AWS IoT Greengrass. In the AWS IoT Core console, under Greengrass, choose Groups, and then choose the group that you created in Module 2. On the group configuration page, choose Lambdas, and then choose Add Lambda. For the version, choose Alias: GG_HelloWorld, and then choose Finish. 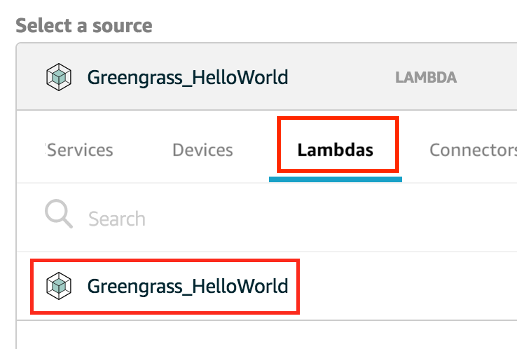 You should see the Greengrass_HelloWorld Lambda function in your group, using the GG_HelloWorld alias. Set Timeout to 25 seconds. This Lambda function sleeps for 20 seconds before each invocation. For Lambda lifecycle, choose Make this function long-lived and keep it running indefinitely. A long-lived Lambda function starts automatically after AWS IoT Greengrass starts and keeps running in its own container (or sandbox). This is in contrast to an on-demand Lambda function, which starts when invoked and stops when there are no tasks left to execute. For more information, see Lifecycle Configuration for Greengrass Lambda Functions. Keep the default values for all other fields, such as Run as, Containerization, and Input payload data type, and choose Update to save your changes. For information about Lambda function properties, see Controlling Execution of Greengrass Lambda Functions by Using Group-Specific Configuration. Next, create a subscription that allows the Lambda to send MQTT messages to AWS IoT. Devices in the Greengrass group. Other Lambda functions in the group. The local shadow service. For more information, see Module 5: Interacting with Device Shadows. The group uses subscriptions to control how these entities can communicate with each other. Subscriptions provide predictable interactions and a layer of security. A subscription consists of a source, target, and topic. The source is the originator of the message. The target is the destination of the message. The topic allows you to filter the data that is sent from the source to the target. The source or target can be a Greengrass device, Lambda function, connector, device shadow, or AWS IoT. A subscription is directed in the sense that messages flow in a specific direction: from the source to the target. To allow two-way communication, you must set up two subscriptions. 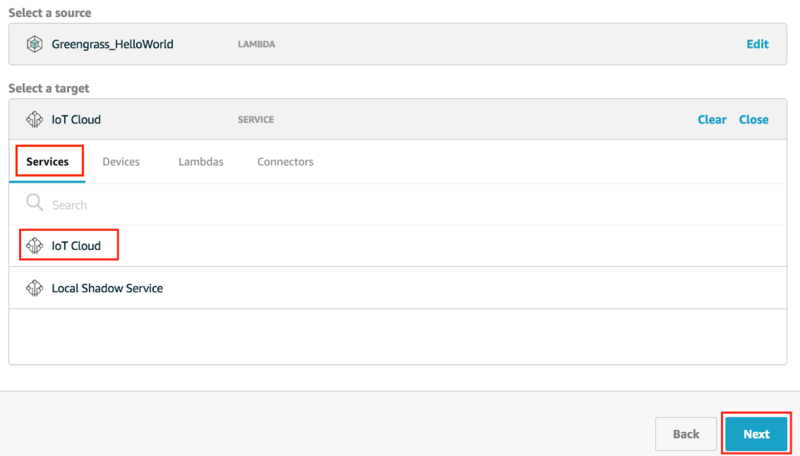 Because the Greengrass_HelloWorld Lambda function sends messages only to the hello/world topic in AWS IoT, you only need to create one subscription from the Lambda function to AWS IoT, as shown next. On the group configuration page, choose Subscriptions, and then choose Add your first Subscription. In Select a source, choose Select. Then, on the Lambdas tab, choose Greengrass_HelloWorld as the source. For Select a target, choose Select. Then, on the Service tab, choose IoT Cloud, and then choose Next. For Topic filter, enter hello/world, and then choose Next.